Stackdriver can verify the availability of your service by accessing it from locations around the world. You can use the results from these uptime checks in your alerting policies, or you can directly monitor the results in the Monitoring uptime-check dashboards. Create a new uptime check. List your existing uptime checks. To view the status of your uptime checks, or to get a list of the IP addresses that might be used to perform uptime checks, see Getting IP addresses. To determine the status of your uptime checks using the API, monitor the metric monitoring.googleapis.com/uptime_check/check_passed. See GCP metrics list for details. Your use of uptime checks is affected by any firewalls protecting your service. If the resource you are checking isn't publicly available, you must configure the resource's firewall to permit incoming traffic from the uptime-check servers. See Getting IP addresses to download a list of the IP addresses. If the resource you are checking doesn't have an external IP address, uptime checks are unable to reach it. For HTTP and HTTPS, the uptime check issues a GET command and retrieves the raw data. If the GET response is a redirection to another URL, the check retrieves the data from that URL. Lastly, the uptime check evaluates the data to determine if the check succeeded or failed. The HTTP status is Success. The data has no required content or the required content is present. Required content is specified using the Advanced options. This section explains how to create and configure uptime checks. Note: All uptime checks use either HTTP GET requests or TCP requests. In the top-right corner, click Add uptime check. In the New uptime check window, fill in the fields for the check, as described in Basic options on this page. Optionally, to access configuration for port, custom headers, and authentication click Advanced options. For details, see Advanced options on this page. To see the result of your uptime check, click Test. If the result isn't what you expect, see the Check failures section below, correct your configuration, and repeat the test. Click Save. You cannot save an uptime check if any required field is missing. If the Save button is disabled, check for missing values. You must enter a value in the Hostname field. The request body must contain an UptimeCheckConfig object for the new new uptime check. The fields in the object are explained in the Basic options and Advanced options sections on this page. Leave the name field of the configuration object blank as it is set in the returned configuration object. The create method returns the UptimeCheckConfig object for the new configuration. If the created uptime configuration doesn't work as expected, see the Check failures section on this page. // Define a new config. // create creates an example uptime check. * TODO(developer): Uncomment and edit the following lines of code. There can be a delay of up to 25 minutes before the uptime check results start to flow into Monitoring. During that time, the uptime check dashboard reports the status as "no data available." To create a new uptime check, you specify values for the uptime check's configuration. When creating the uptime check in the Stackdriver Monitoring console, you fill in a form. When creating the uptime check in the API, you supply the corresponding parameters to an UptimeCheckConfig object. Title: A name to identify your check. For example, Example.com uptime check. Check Type: Select an HTTP, HTTPS, or TCP protocol. If you select HTTPS, the service attempts to connect over HTTPS, but doesn't validate the SSL certificate. For example, expired or self-signed certificates won't cause a check to fail. App Engine: App Engine applications (modules). Elastic Load Balancer: AWS load balancer. Instance: Compute Engine or AWS EC2 instances. In the API, this is split into gce_instance and aws_ec2_instance. URL: Any IPv4 address or hostname. Path and port are entered separately. Applies to (App Engine, ELB, or Instance): You can apply your uptime check to a single resource or to a group of resources, such as All instances. If you choose a single resource, pick one from your existing resources listed in the menu. If you use the API, fill in the monitored resource with the required resource labels, as described in the Monitored resource list. Module (App Engine): Specify your application module. Hostname (All except for App Engine): Specify your service's host name. For example, enter example.com. 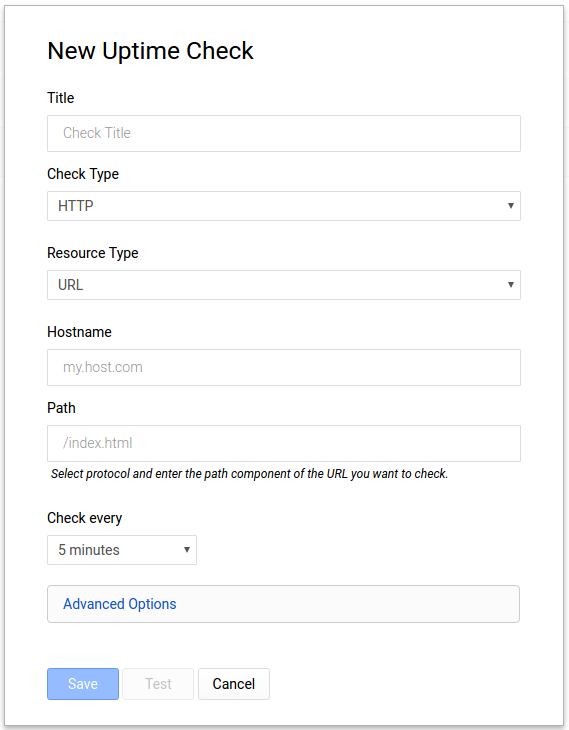 Path (HTTP, HTTPS): Enter a path within your host or resource or use the default path. For example, to probe example.com, leave this field blank. To probe example.com/tester, enter /tester. Do not include the prefix example.com. In the API, leave this field blank to use the default value, /. Port (HTTP, HTTPS, TCP): Choose a port for the connection. For HTTP and HTTPS checks, this option is under Advanced Options. In the API, leave this field blank to use the default value: 80 for TCP or HTTP checks, and 443 for HTTPS checks. Response content contains the text (HTTP, HTTPS, TCP): Fill in a string (max 1024 bytes) whose presence in the check response indicates success. The check will fail if the string does not appear anywhere in the response. For HTTP and HTTPS check, this field appears under Advanced Options. In the API, this is the ContentMatcher object. Check every: 1, 5, 10, or 15 minutes. For example, if you select 5 minutes, each geographic location attempts to reach your service once in every 5 minute period. Using the default 6 locations, and checking every 5 minutes, your service sees an average of 1.2 requests per minute. Checking every 1 minute, your service sees an average of 6 requests per minute. Create checks against direct URLs, not redirection URLs, when possible. If you must create checks against redirection URLs, increase the Healthcheck Timeout from the default of 10 seconds to 30 seconds or more. See Advanced options for more information. The Advanced options section applies to HTTP, HTTPS, and TCP check types. HTTP Host Header: Fill this field in to check virtual hosts. This field isn't available for TCP checks. Port: Specify a port number. For TCP checks, this field appears in Basic Options. Response content contains the text: Fill in a string (max 1024 bytes) whose presence in the check response is a condition for success. For TCP checks, this field appears under Basic Options. Locations: Select the applicable geographic regions where your check is to receive requests. You need to select enough regions to have at least three active locations. When creating a check, the locations in each region are listed below the name of the region. New checker locations in selected regions automatically send requests to the configured destinations. To always send requests from all available locations, select Global. To send requests from all location in existing regions, but not new locations in new regions, select all the existing regions but don't select Global. Custom Headers: Supply custom headers, and encrypt them if necessary. Encryption hides the headers' values in the form. Use encryption for headers related to authentication that you don't want other members of your team to see. This field isn't available for TCP checks. Healthcheck Timeout: Specify a timeout, from 1 to 60 seconds. An uptime check fails if healthchecks from more than one location don't get a response within the configured timeout period. If only one healthcheck doesn't get a response, then the uptime check doesn't fail. Authentication: Provide a single username and password. These values are sent as an Authorization header. If you set values here, don't set a separate Authorization header; if you set an Authorization header, don't set values here. Passwords are always hidden in the form. This field isn't available for TCP checks. You can get the uptime-check ID from the response of a method invocation to create or list uptime checks. You can also find the uptime-check ID on the Stackdriver Monitoring console page for the uptime check, in the Check ID field on the Check config panel. When you create an uptime check in the Stackdriver Monitoring console, you can test the configuration before you save it. The response has no required content or, a search of the response for the required content is successful. Connection Error - Refused: If you are using the default HTTP connection type, check that you have a web server installed that is responding to HTTP requests. This can happen on a new instance if you haven't installed a web server; see the Quickstart for Compute Engine. If you use an HTTPS connection type, you might have to perform additional configuration steps. For firewall issues, see Getting IP addresses. Name or service not found: The host name might be incorrect. 403 Forbidden: The service is returning an error code to the uptime checker. For example, the default Apache web server configuration returns this code under Amazon Linux, but it returns code 200 (Success) under some other Linux versions. See the LAMP tutorial for Amazon Linux or your web server's documentation. 404 Not found: The path might be incorrect. 408 Request timeout, or no response: The port number might be incorrect, the service might not be running, the service might be inaccessible, or the timeout might be too low. Check that your firewall allows traffic from the uptime servers; see Getting IP addresses. The timeout limit is specified in the Healthcheck part of Advanced Options. If you want to be notified of uptime failures, create an alerting policy for your new uptime check. See Alerting on uptime checks for details. To view a list of your uptime checks, in the Stackdriver Monitoring console, go to Uptime checks > Uptime checks overview. Your uptime checks might be listed on multiple pages. Enter text in the Filter field to limit the list to checks with that text in their titles. Use the button to the left of the Filter field to filter for members of a specific group. Click an uptime check to show more detail about the check. name: The full name of the uptime check configuration. You can get the [UPTIME_CHECK_ID] from the response of a create or list method. The ID isn't shown in the Stackdriver Monitoring console. // list is an example of listing the uptime checks in projectID. // of the form `projects/[PROJECT_ID]/uptimeCheckConfigs/[UPTIME_CHECK_ID]`. In the Stackdriver Monitoring console, go to Uptime checks > Uptime checks overview. Your uptime checks might be listed on multiple pages. In the Uptime Checks Overview, to the right of your uptime check's summary, click Edit. Change the values of the fields as needed. You can't modify all fields. If the custom header values of a check are hidden, you cannot make them viewable. To verify if the check works, click Test. If the test fails, see Check failures for possible causes. The request body must contain an UptimeCheckConfig with the new field values. If updateMask is set, then only the fields listed in updateMask replace the corresponding fields in the existing configuration. If a field has subfields, and the field is listed in the field mask but none of its subfields are, then all subfields of that field replace the corresponding fields. If updateMask isn't set, then the configuration in the request body replaces the entire existing configuration. The patch method returns the UptimeCheckConfig object for the altered configuration. There can be a delay of up to 25 minutes before you see the new uptime check results. During that time, the results of the former uptime check are displayed in the dashboards and used in alerting policies. Before deleting an uptime check, remove the check from any alerting policies that use it. If you don't remove the uptime check, you can't delete the uptime check through the Monitoring console. If you delete the uptime check through the API, the alerting policy ignores the missing uptime check. The policy doesn't create an incident for the missing check. In the Stackdriver Monitoring console, go to Uptime checks > Uptime checks overview. In the Uptime Checks Overview, to the right of your uptime check, click Delete.